¡Bienvenidos a Panamá! — Welcome to Panamá! 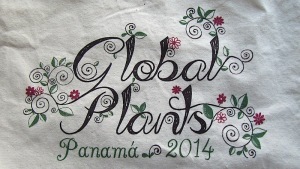 This week, some 150 delegates from around the world converged on Panama City to discuss the Global Plants Initiative (GPI). Global Plants started as a mechanism to faciliatate access to African type specimens for the African botanical community—the African Plant Initiative—this was then expanded to include the Latin American Plants Initiative to capture Central and South American type specimens. We now have the lofty goal of imaging all vascular plant type specimens. Michelle Waycott (Chief Botanist) and Ainsley Calladine (GPI project manager) of AD are attending, along with a number of other Australian herbarium staff involved with the GPI project. The current Chair of the GPI Steering Committee is Australian Prof David Cantrill, Chief Botanist and Director, National Herbarium of Victoria (MEL). In his opening presentation, David outlined the progress made since the last Global Plants meeting in January 2013. The partnership currently includes 330 herbaria from 74 countries contributing more than 2.1 million objects now archived and delivered by JSTOR—this represents an amazing coordinated effort. David announced the new Steering Committee members and he is to remain as Chair. Australia is represented by a strong contingent, apart from Michelle, Ainsley and David, Kevin Thiele (Chair of CHAH and Curator of Western Australian Herbarium), Darren Crayn (Director, Australian Tropical Herbarium), Brendan Lepschi (Curator, Australian National Herbarium) and Rita Macheda (Database Officer, National Herbarium of Victoria) have participated. The organisation of the meeting has been supported by some excellent staff at the Smithsonian Tropical Research Institute based in Panamá. The multicultural audience is supported by live translations of the proceedings. This highly professional service is critical for the effective communication of materials during the sessions. After more plenary talks in the morning, there were group sessions discussing a range of issues with an aim to identify strategies for the future on a number of topics in the context that the major funding that has supported the current digitisation program is ending. During the discussions outside the sessions there is a great spirit of collaboration, sharing of ideas and lessons learned. The strong sense of a shared vision and common purpose still pervaded discussions. However the realisation that the work being done was shifting its focus towards the use of the resource rather than generating the resource began to surface during sessions and in conversations. Given the origins of the program, which was to facilitate the sharing of type specimens around the world by botanists in different parts of the world, this is a logical and inevitable shift. The final day of the meeting included a wrap up of each of the outcomes from discussion sessions that will go forward for the GPI community to work on. Among high priority suggestions were: priority one to at least finish ‘one-name one-type’; identifying the ‘missing types’ and a model of getting the information together to fill those gaps; improvements to data handling and editing; working towards access to the high resolution images for all the GPI community; ideas about bringing in new partners; communication of outcomes to make the resource more interesting to others. The conclusion of the main meeting saw the project support staff from the Smithsonian, Glora and Nelly getting a standing ovation recognising the above and beyond contribution these wonderful individuals have made to this program. This entry was posted in News on 29 September, 2014 by Michelle.